Applications will be able to run in the background – enabling "true" multitasking as we see on Windows Mobile, rather than the more limited multitasking available on PalmOS (which doesn't really multitask at all) and iPhone (which does not allow third-party apps to run in the background). Applications will have open access to your PIM data – so contacts, calendar, email and messaging are all fair game. webOS's "Synergy" concept means it will be able to integrate data from multiple web services into one view. Applications will have access to the innovative pop-up notification area, giving you some limited control over what they're up to at all times, no matter what else you're working on. So, are you pumped? Primed? Onwards! Who are they? Named as the first (and limited-time exclusive) US carrier of the Palm Pre, Sprint needs no introduction. Much like Palm, the beleaguered US phone network has been shedding subscribers of late as it fights a pitched battle against popular perceptions of unreliability and mass customer dissatisfaction. One bright spot: the network came up trumps in Gizmodo's coast-to-coast 3G download speed test, although it was bested in upload rates by rival AT&T. "In today's market, iconic devices, no question, they move the needle, they grab attention. And we're very excited about the Palm Pre. I will give (BlackBerry manufacturer) Research In Motion credit for creating a great business phone and the iPhone, I give it credit for being a great consumer device. This is the first one I belive that really crosses both. It's an outstanding business device and it's also a whole life consumer device. It's a combination of a superb touch screen with a physical keypad, which is, for a heavy e-mailer and texter, a must. We think it's going to be a very successful device." What's their contribution to webOS? Sprint recently announced a mobile Java platform named Titan, which combines a Java development environment with the OSGi Framework, which as described by Java developer David Beers is "a service platform that enables developers to create software by plugging together software components... widgets can interoperate with other components in the container: components for GPS location, messaging, multimedia, etc..." According to Beers, webOS's architecture bears "more than a passing resemblance to Titan". In layman's terms, OSGi is a cross-platform technology which - should Palm choose to take to its logical conclusion - will mean developers could write Java-based webOS apps that will run with the performance of native apps, with a native look-and-feel, no matter which underlying OS is running the show, be it Linux, Windows or OS X. Which in turns means that when Palm announce their desktop plans for webOS devices – and it's more likely than not that a desktop component is in the pipeline – they're possibly going to include some kind of capability for webOS applications to also run on your desktop or laptop PC. Developers could target a range of different platforms with little effort. Could be a very compelling proposition and enable Palm to entice a lot of third-party talent. What does all that have to do with Sprint and Titan? Well, Sprint already has their own base of mobile developers that they will surely be eager to convert to their shiny new toy, and if webOS is utilizing Java and OSGi then Titan developers shouldn't have too much trouble porting over applications they may have already developed for other Sprint handsets. How will it integrate with webOS? There's a lot of potential here. For starters, we know that it will be completely integrated with your contacts via Synergy: so, for instance, when your Facebook friends update their profile picture, so too will their contact picture on your phone without you having to lift a finger. Any contact information they have on their profile – phone numbers, email addresses and IM names – will also appear on your phone and be cached locally for offline access. In addition, any Events that your friends have listed on Facebook will also appear on your webOS calendar – as leaked screenshots from the Mojo SDK seem to imply. Apart from the PIM aspect, the webOS Facebook application should also – in theory – allow you access to the full suite of custom Facebook apps that are available on the desktop site, as the web-based development environment should make it simple for anything featured on the desktop version to be available natively on webOS. Finally, as webOS apps have access to the pop-up notification area, running Facebook in the background should allow new Facebook notifications to be instantly delivered to your phone, from status updates to Wall posts to photo and Note tagging. Who are they? Perhaps the biggest and most popular provider of online services, Google have a massive range of web applications that could (and undoubtedly will) be ported to webOS. Apart from the world's most popular search engine, Google also offer Google Maps, Gmail, Google Calendar, Google Docs, Picasa (a photo sharing service)... the list goes on and on. Oh, and they also own a little thing called YouTube. Perhaps you've heard of it. How will they integrate with webOS? Oh my. How won't they? We already know that webOS's universal search feature will allow you to start hammering away on the keyboard and instantly begin a Google (or Google Maps) search with one touch. We know that it's going to integrate your Gmail contacts and Google Calendar with their webOS counterparts via Synergy. Apart from this, there's also the tantalising possibility of fully-featured offline versions of Gmail and Google Documents – the latter which should be welcome news to anyone who wants an alternative to Documents to Go. Gmail will be able to easily notify you of new messages via notifications, and you'll have access to your contacts from other web services via Synergy, thus putting it a step ahead of even the desktop version. YouTube access still has a big question mark hanging over it; however, it's reasonable to assume there'll be some kind of custom webOS YouTube browser, given how popular the same has proved to be on the iPhone. Failing that, rumours abound that a fully-fledged Flash plugin is being developed for webOS and it seems credible, based on Pre's beefy hardware. Finally, we're still optimistic that video recording capability will eventually be included, and once it is a direct "upload to YouTube" option would be made available. Who are they? From their website: "At Pandora, we have a single mission: To play only music you'll love." Pandora is a streaming Internet music service, which allows you to fine-tune playlists based on artists you already know you like. You create your own "stations" with a seed artist or song, and Pandora will then throw similar songs out at you, identified by way of their Music Genome Project, the "most sophisticated taxonomy of musical information ever collected". You further fine-tune your stations by rating songs with either a thumbs-up or thumbs-down rating. They used to be globally accessible, but went U.S.-only a few years back (much to the bitter, bitter disappointment of this Australia-based writer). It's a fantastic way to introduce yourself to bands you might otherwise have never had the opportunity to hear. How will they integrate with webOS? Like most of the other software partners, Pandora will greatly benefit from the pop-up notification area, which should allow you to easily give a thumbs-up or thumbs-down to particular tracks without having to jump back to the app proper. Same deal with playback controls. The biggest frustration for users of the otherwise-excellent iPhone version is that it can't run in the background, thanks to Apple's draconian software rules. The webOS edition should have no such limitations, given Palm's trumpeting of webOS's multitasking capabilities. Finally, just as the iPhone version gives you an option to buy tracks from iTunes, it's possible the webOS Pandora will provide links to buy from Amazon's music store, for which a custom webOS application was demoed at Palm's CES event. If you're curious to hear what Pandora think of webOS and the new Pre, you can check out our interview with Pandora CTO Tom Conrad. 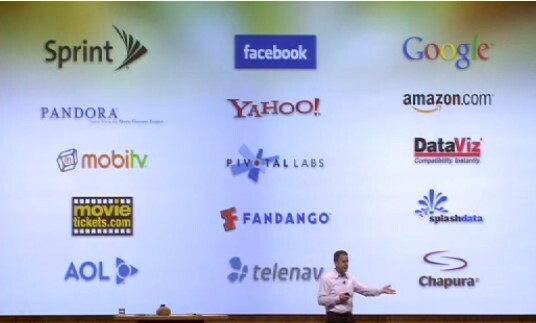 Join us on PIC next week, where we'll once again let the speculation run rampant regarding webOS partners Amazon, Yahoo!, mobiTV, Pivotal Labs and DataViz. Damned straight. Palm is showing little love/loyalty to those that stayed. We have to wait like beggars to see if a 3rd party developer can throw us a scrap. I for one am no longer a beta tester for Palm. Once StyleTap is iphone capable I'm outta here. I'm wondering where the Faithful will then congregate? I imagine PIC will be all over the WebOS. Maybe we'll see a StyleTap forum. I have to agree with you there. This launch shows a lot of pushing out the little guy. But then, for the past ten years, the little guy had plenty of opportunity to grow up. There are several that are quite content coding in their den at home as they turned over hot office girls that worked as "personal assistants" and had no desire to lead a group to grow a company. You all know who you are. On a big corporate level, they have a good shot at mostly taking some Blackberry customers. I don't see much of an iPhone issue here since they are more looking at corporate and enterprise sales in their focus. So how many are buying Palm stock now? It doubled right after the announcement. @ Tuckermaclain : What? I don't understand what you're complaining about. 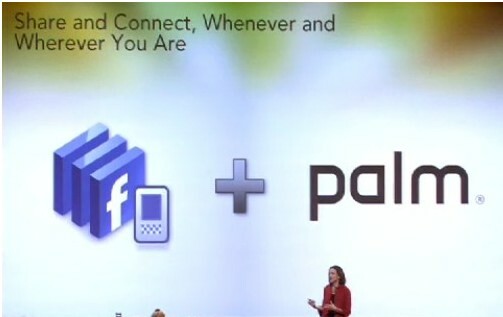 Isn't Palm showing love to loyalists by finally putting out a modern operating system? Have we not been complaining that Garnet is too old for the last five years? I'm all for it if they gave us an emulator. I'd put a deposit on one today. Imagine if Vista was not compatable with any software from DOS to XP. Imagine that there is alot of stuff you have on your computer that you don't want to toss. That's why I'm upset. I'd be MUCH happier with an iphone with styletap (which is in the works per styletap) than with a Pre on a 2 year contract hoping to get an emulator while I'm lugging around a Tungsten. I want to move into the 21st Century too and toss my Razr. Palm expects me to trash everything and jump onto the Pre bandwagon because they have a Facebook app. Rubbish. I'd imagine that developers who stuck it out with Palm will think twice about investing time coding in Web-OS when Palm killed (is killing) PalmOS. I think the developers of Palm OS have had a pretty good run with a mobile platform. They still will have plenty of devices out there on Garnet (even the TX continues to sell). To be honest, there are only a handful of apps on my Treo that I would miss - and not enough to stop me from changing OS. Pretty good bet that the Pre will be well supported by developers. All looks good to me so far. This is your (faulty) imagination. Apple never said such a thing. I said from the get-go there'd be a proper SDK. And I say the same for the *Pre* too. 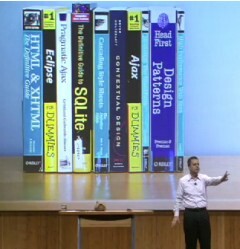 And no, I don't mean CSS/HTML/Java. We'll get C+ or whatever too. Probably more like dodgy journalism if that was untrue. But my point is; doesn't 'change' come with the territory in the tech market? >>>But my point is; doesn't 'change' come with the territory in the tech market? Just don't bring up the Commodore-64 or Amiga here or you'll get all the non-change nostalgiacs. Easy does it on the OSGi, stuff pardner! It's one thing for an addlepated, null-pointer-dereferencing developer/blogger (me) to go speculating about there being an OSGi application server under the hood of webOS. It's another thing altogether for a respectable publication like PalmInfocenter to trade in such non-FDA approved psychotropic acronyms. You have a responsibility to your readers, Tim, whereas I have a responsibility only to the voices in my head! I'd like to qualify several things that you're quoting me on or suggesting that I might have been suggesting. But I think I'm too tired to bother. I will say this, however. According to my calculations, webOS, if bombarded with particles of OSGi at around 550MeV in a Large Hadron Collider positioned a few hundred yards to the southwest of Palm headquarters *could* cause the residents of Cupertino to be inundated by a 30 foot wall of molten lava. Or at a minimum drop some seriously loose coconuts on unsuspecting heads. Either way, watch out Apple! RE: Easy does it on the OSGi, stuff pardner! Basically, there's enough in webOS for Sprint to lick its chops over enhanced cloud services it will be able to offer with its existing programming investment. There. Did it in one sentence.